Are true bespoke suits custom or made-to-measure? Home Blogs dlnadmin's blog True bespoke suits; What's the difference between custom and made-to-measure? Custom or bespoke, and made-to-measure are terms that are often used interchangeably, but actually mean very different things. So what are true bespoke suits? You’re reading this information on a page we call “Bespeak”. Coincidentally, the process of creating a bespoke garment is the act of bringing out that which is in your mind’s eye, by using your words to speak it into something tangible and real. Hence a bespoke suit, is a suit that has been “Bespoken” into being. Some people enjoy being involved in every detail of creating their garments, while others prefer to give their tailor a general vision and let them take on the rest. As a real world analogy; you can go to a sushi bar with a menu, but in very exclusive Japanese restaurants, diners do not order, but rather, have faith that the chef will be able to fulfill their expectations for the meal. This is called ‘omakase’, which translates to “I’ll leave it to you”. This almost intimate relationship between the diner and chef parallels that of a tailor and a client. True bespoke is not intended to draw from a menu, but rather, think of your tailor as a personal chef, asking you “what do you feel like having?” You can say you want something as specific as I’d like a crêpe, you can say “I’m craving something French”, or you can go the omakase route and just say, “I’m hungry”. Many times, a client may simply say “I think that it’s time to add another navy suit”, and the tailor will start asking a few questions: where the will the suit be worn, occasion, time of year… all while building an understanding of the client’s personality, lifestyle, and taste. It’s from that conversation, that the tailor will pull the vision from the client, and will create a one of a kind garment based on all of these factors. 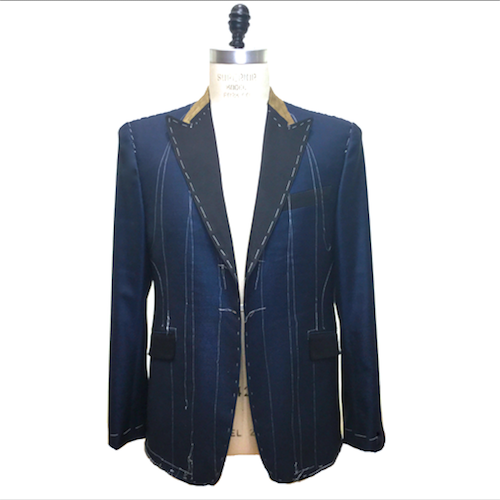 This is the true definition and experience of custom and bespoke tailoring. So as you can now see, if this is true custom, then you can see that these words are used incorrectly more often than not with little regard for its real pedigree. We are confident in saying that 98% of the time, when designers advertise their lines as ‘custom made’, they are actually providing a made-to-measure option. True custom should be no different than bespoke, and true custom bespoke is much more a rarity than the rule. All that you need to know is that if you walk into a store and their custom experience reads closer to a checklist, it is not custom, it is in actuality made-to-measure. Many brands today will offer a made-to-measure program. A salesperson will take your measurements. Then, after the client has “left the room”, those measurements will be sent off to any of a hundred different MTM houses. A tailor will then try to match those measurements to the closest pattern available that the designer had laid out for the mass market. Finally, with a few adjustments made for your specific measures (since were defining so many things) the process continues with what is called blue penciling. In a very raw description, that means add a little here, take a little there. Unlike true custom, they cannot, will not be able to deviate from the original silhouette, and will only be able to add certain custom styling details and accouterments such as button color, flaps no flaps, linings etc. Overall, made-to-measure is intended to have a designers’ suit fit your body to the best of that suit’s ability. That is the curtain pulled all the way back Mr. Oz. Last and certainly least, there is off-the-rack suits. That’s about all we have to say about that.